Dammam (an aw Ad Dammām) (Arabic: الدمام‎) is the caipital o the Eastren Province o Saudi Arabie, (the maist ile-rich region in the warld). The judicial an admeenistrative bodies o the Eastren Province an several govrenment depairtments are locatit in the ceety. Dammam is the lairgest ceety in the Eastren Province an third lairgest in Saudi Arabie efter Riyadh an Jeddah. It is an important commercial hub an port in Saudi Arabie. 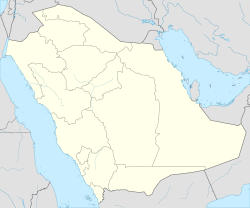 Dammam, an the rest o the Eastren Province, is served bi the Keeng Fahd Internaitional Airport (KFIA), the lairgest airport in the warld in terms o land aurie (approximately 780 km2), aboot 20 km tae the northwast o the ceety. Dammam's Keeng Abdul Aziz Sea Port is the lairgest on the Persian Gulf. Its import-export traffeck in the kintra is seicont anerlie tae Jeddah's port. The oreegins o the name "Dammam" is controversial, some say that it is onomatopoeic an it wis gien tae the aurie acause o a drum poseetioned in a nearbi keep, when soondit for the alairm it produced a melody cried "damdamah", ithers say that the name wis gien accordin tae the Arabic wird "dawwama" (whirlpool) which indicatit a nearbi sea steid that Dhows uisually haed tae avoid. Wikimedia Commons haes media relatit tae Dammam. This page wis last eeditit on 30 August 2018, at 14:30.